A new year means new life, and the stage for the spectacle this month is Tanzania’s southern Serengeti. Specifically, Lake Ndutu and the Ngorongoro Conservation Area are prime territories for viewing this phase of the migration. The start of the year also marks the beginning of the “green season”, right between the short rains and the long rains. The Serengeti Plains form a beautiful palette of green colors, the air is clear from dust and wildlife of all kinds is relatively easy to spot. As the grass turns green, it also attracts the wildebeest moving in from the north into southern Serengeti, Ndutu, Ngorongoro Conservation Area and Salei Plains. Some afternoon showers can be expected, but they only last for a short period and usually don’t affect your game drives. Temperatures reach an average high of 28°C (82°F) and a low of 15°C (59°F). January is a warm month, and other wildlife is easier to spot since the vegetation is less lush. Animals tend to gather around rivers and water holes. By this time of year the female wildebeest are in their final month of pregnancy. As soon as the rain starts to fall, top priority is to seek new-growth grasses as sustenance for their newborn youngsters. Due to the year’s end holidays, tourists abound -- especially in the Ngorongoro area. But with good planning the big lodges and crowds around the crater’s rim can easily be avoided. One of the best Serengeti lodges to set camp at this time would be Lake Ndutu Luxury Tented Lodge. It´s right in the middle of the action. Other options include season camps like Olakira Camp, Serengeti Safari Camp and Serengeti Under Canvas. The "green season" is another name for the rainy season, which stretches from late October to May. It’s easy to see where the imagery comes from -- the thirsty plains soak up the water and spring to life. Parched chalky brown land becomes a luscious green, and the migratory animals are drawn to the fresh grass. The rainy season is actually divided into two. From October to December the "short rains" fall, and the months March to May bring the "long rains". Where does the moisture come from come from? During the green season, the dominant winds are blowing from the warm ocean to land and bringing with them evaporated water from the Indian Ocean. As the air cools over the land, the water condenses as rain. This time of year, it rarely rains all day. You're still likely to see plenty of sun and wildlife. Lots of baby animals are born at this time -- hundreds of thousands of them on the Serengeti Plains alone. As with any off-season, the crowds are fewer, adding to the benefits of a safari at this time. In February the best migration action takes place in Ndutu in the heart of the Serengeti Plains. Behold the classic image of endless plains, blanketed and dotted as far as the eye can see with grazing wildebeest and their newborn calves. February is still the start of the rainy season (specifically, the long rains of the green season are beginning), but these expected sporadic showers rarely last all that long and do not usually pose much of an inconvenience while game driving. This month is all about multiplying. In February Ndutu turns into a stage for the same astonishing show that began in January – the annual wildebeest calving. Around half a million young wildebeest come into the world each February alone. During calving season, pregnant female wildebeest opt to give birth in this area due to the grass’s richness in calcium and magnesium, which is good for milk production. As a result, a vast herd begins to form. They can now be found grazing on the short grasses. As soon as the calving season begins, so does the big feast for the cats. Lions, leopards and cheetahs can gain weight quickly and store energy for the future. For now, life is easy as they enjoy tasty morsels of vulnerable wildebeest calf. For that reason, February is also one of the best months for action photography and to just watch in awe as the powerful predators hunt. Since the migration is still so concentrated in the Ndutu area we recommend staying at Masek Tented Camp, Lake Ndutu Luxury Tented Camp, or Ndutu Wilderness Camp. Wildebeest females give birth to a single calf in the middle of the herd, without seeking a secluded place as many of their antelope relatives do. Amazingly, about 80% of the females calve within the same two to three week period, creating a glut for predators. There’s strength in numbers, enabling more calves to survive the crucial first few weeks. A calf can stand and run within minutes of birth. It immediately begins to follow its mother and stays close to her to avoid getting lost or killed by waiting predators. Within days, it can run fast enough to keep up with the adult herd. A calf eats its first grass at about 10 days, although it is still suckles for at least four months. Even after weaning, it will remain with the mother until the next year’s calf is born. At that time the young males are driven away, but the females often remain in the same groups as their mothers. After a long period of grazing in the Ndutu region, the green grass is now so munched up that there isn’t much left to eat for the wildebeest. Time to move on. The long rains are starting to build up, so expect some afternoon showers. You’ll hear rumblings of thunderstorms to the north and west, and soon the herds will be following their noses in search of rains and fresh grass. By this point, the green plains are filled with white patches of bones and carcasses, and vultures and other scavengers are feasting on the leftovers. The wildebeest and the Thomson’s gazelle continue to give birth until mid-March. They still occupy the Ndutu and Kusini Maswa region, but due to the lack of food, they gradually start preparing for the next leg of the migration. Because of the newborn calves, they move slowly and predictably. Predator activity is still very busy. Lions, leopards and cheetahs continue to revel in the easy prey. This also makes Ndutu unique because it’s one of the few wildernesses where lions and cheetahs can cohabitate in peace, as there is more than enough food for all predators for a substantial part of the year. Just like February, the Ndutu region is still the place to be. Masek Tented Camp, Lake Ndutu Luxury Tented Camp, or Ndutu Wilderness Camp are top picks for this region. At the heart of the South Serengeti lies the world famous Ndutu Lake area. Offering consistently the best wildlife viewing during the green season, Ndutu is strategically situated at the center of the southern plains, in Tanzania’s Ngorongoro Conservation Area. Blanketed with a forest of acacia trees, this is where the wildebeest give birth, and during the calving season in February to March, the fields are dotted with millions of white little youngsters. Ndutu is also one of the best places to see the six different species of cat – lion, leopard, cheetah, serval, caracal and wild cat. During the calving season it’s also the top destination if you want to see cheetahs in action hunting the newborn. Year-round, the wet marshes provide for a huge amount of resident animals and wetland bird life. Since the 1960s, Ndutu had been a favorite destination for many distinguished authors, filmmakers, and wildlife biologists. Researchers Jane Goodall and Hugo van Lawick used Ndutu as a base for much of their research. Big rains mean thicker vegetation and scattered herds, which makes viewing more of a challenge. But the rewards of the low season are lower prices and few other people as the migration makes its way into “big cat territory”. This is the period of mvua za masika, Swahili for “big rains”. The vegetation becomes very thick and lush, making wildlife spotting somewhat difficult. An even bigger challenge is the roads. Some of the dirt roads get totally washed out and become almost impassable. Because of the plentiful water, the animals tend to scatter, which makes them a little bit harder to find -- for both predators and safari-goers alike. 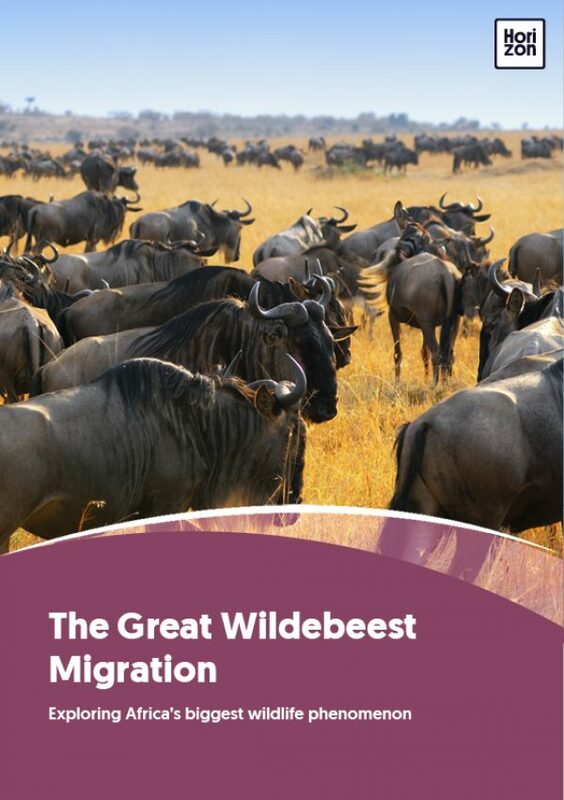 The wildebeest leave the Ndutu region and head northwest past the Simba Kopjes and towards Moru. They continue moving slowly, as the babies are still small and learning to use their legs. The good thing about April is that prices drop. You’ll find safari and accommodation rates at a year-round low. Expect to be almost on your own with the animals. April is one of the best months for lion activity as the wildebeest cross into the Simba Kopjes, which is known for being big cat territory. Many lodges start to close, but Serengeti Serena Safari Lodge tops the list of the best Serengeti lodges for game-viewing during this time. It’s designed to blend into the landscape and you will be close to the action. We’ve all heard the lyrics from the famous Toto 1982 hit song “Africa”. There’s a grain of truth in the words. For the animals and people living in Serengeti and Masai Mara, the big rains mean the difference between life and death. Throughout the whole drought season, the Masai tribes patiently await the rains to fill the rivers, water their crops and relieve their cows of thirst. Even today, many tribesmen perform rainmaking ceremonies. It’s called the mukwerera, and for a few days all the members of the tribe gather around a holy muchakata tree to dance and pray to their ancestors for a generous amount of rain. Unfortunately, global warming has taken its toll on the region. The droughts are now getting longer, and the rains are getting heavier, causing flooding. A recent study shows that the Horn of Africa is drier than any time in the last 2,000 years. The big rains taper off and the herds are on the move, due north toward Kenya. Routes diverge somewhat, but they’ll all funnel through a narrow corridor between two rivers in a dramatic spectacle. Although May is still considered to be wet season, the heavy rainfall gradually gets less and less. Since the ground is still wet and muddy, the driving conditions can be a bit of a challenge. But just like in March and April, the prices are still low and you can expect to find some good deals. By the end of May, the dry season begins and the migration starts making its way back north. With pleasant temperatures and some amazing scenes of the vast herds pouring through the narrow central regions, this is actually one of the best times of year for a safari. The wildebeest begin to make their way through the western corridor of Serengeti. Some of them continue north to the Seronera region, but most of the migrating herds enter the Ndoha and Dutwa Plains that flank the Mbalageti River. At the end of the month, they pile into the narrow wedge of land between the forest-lined riverbeds of the Mbalageti and Grumeti. Many lodges will still be closed, but all open camps around the Seronera region are still a good option. The Fours Seasons Safari Lodge is highly recommended. What guides the wildebeest? Raw instinct? Or cues from their surroundings? Probably a combination of both. The wildebeest journey is dictated primarily by their response to the weather. They follow the rains and the growth of new grass. And, although there is no scientific proof to support this, it seems that they react to lightning and thunderstorms in the distance. Instinctive knowledge plays a large role, hardwired into their DNA by hundreds of thousands of years of natural selection. That’s how these “clowns of the plains” know which direction they must travel. Over the millennia, those that went the wrong way would have died of thirst or starvation long before they could reproduce. The successful ones were those who went the right way. The skies are clear, the land dries out, and the herds gain strength and power as the calves mature. But June is no walk in the park. The wildebeest must overcome the obstacle of the crocodile-infested Grumeti Rivers en route to Kenya’s Masai Mara. By June the long rains have stopped, and dry season is in full swing. It will stretch from the end of May to early November. The weather is sunny with some easing thunderstorms in the evenings. As the skies clear up, the landscape undergoes a dramatic change. The plains turn dry and open. This makes game viewing a lot easier, as animal activity concentrates around the remaining sources of water. The migration continues heading north toward Masai Mara in Kenya. The herds are beginning to grow stronger and faster. Since the calves are growing up, the wildebeest travel collectively at their peak speed, covering up to 150 km (93 miles) per day. There’s power, it seems, in numbers. But now the first real troubles begin. Before entering Kenya, they first have to pass the hurdle of the Grumeti Rivers. Rather than one big continuous river, Grumeti consists of shallow pools and swamps. Making their way through the swampy wetlands is a struggle, but even worse are the big, hungry saltwater crocodiles waiting by the shores. Unless you are fainthearted, look forward to some good action as nature takes it cruel course. At this point there are several lodges in the Serengeti that offer mobile operations. The most popular ones include Singita’s safari lodges, Faru Faru, Sabora and Sasakwa. To get close to the Grumeti river crossings we recommend Serengeti Tented Camp and Kirawira Camp. After travelling for several weeks, the wildebeest have only one thing on their minds: a drink of water. But they’re completely unaware of the danger when they cross the rivers. Crocodiles lurk below the surface, waiting for the right moment. They are not just any crocodiles. They are Nile crocodiles -- the second largest crocodilian after the saltwater crocodile. On average, the adults can range between 2.8 and 5 meters (between 9’2” and 16’5”) in length. Crocodiles are very fast over short distances, even on dry land. Their sharp teeth can tear and hold onto flesh. Their jaws have the strongest bite of any animal. A crocodile will grab and hold onto the prey, dragging it into water and drowning it first. Then other crocodiles will come along and share the meal. Crocodiles go back to the time of dinosaurs. Their slow metabolism allows them to go long periods without food. The river crossing normally lasts about two weeks. During this period, the crocodiles can store as much as 150,000 calories -- enough to survive until the next migration season. Each year, an estimated 25,000 wildebeest don’t complete the long migration. These wetland predators are responsible for thousands of the annual casualties. This month is prime for viewing what many consider to be the main act of the migration theatrics -- the crossing of the Mara River. The herds will migrate from Tanzania to Kenya and into the golden grasslands of the Masai Mara. In July the weather is warm with hardly any rainfall at all. Sunny skies bring about beautiful mornings and evenings which are extraordinary for photography. As the land dries out, driving conditions are much improved over previous months. But with the pleasant weather comes the big wave of tourists. The prices go sky high, and you need to book in advance to guarantee a bed. If you’re looking for a budget safari, try a different season. This is the when the famous river crossings through the Mara River begin, especially at the end of July. In search of fresh grass, the migration keeps pushing north through some of the most beautiful areas of the northern Serengeti. As the landscape transforms from lush and green to the iconic golden savannah fields, it gets easier to spot wild game of all kinds. Elephants, giraffes and even the smaller game can be spotted miles away. You will see the sort of beautiful landscape you are familiar with from movies like “Out of Africa”, so it’s worth the struggle with the crowds. The best place to stay for watching the migrating wildebeest cross the Mara River is Kirawira Serena Camp and Mara Serena Safari Lodge. These lodges are poised at the center stage of one of Africa’s most dramatic wildlife arenas. Guest enjoy spectacular views over the savannah and down to the Mara River. The crossing is the single greatest hurdle the animals face during their journey. The wildebeest converge at the river, in their tens of thousands, congregating on the banks awaiting the moment when the more fearless among them will take the plunge. Meanwhile the scavengers and predators await, licking their chops. The plunge begins, driven by hunger and urged on by herd mentality. The first few on the frontline jump, then the rest follow suit, transfixed by this wild frenzy. As they reach the other side, they learn that getting out of the river is just as dangerous as jumping in -- sometimes the opposite bank wall is too steep. Thousands of animals are trying to ford the river at this point -- a recipe for disaster. The muddy rocks offer little grip to their hooves, and the breathtaking spectacle is turning to tragedy. Yet the wildebeest seem programmed to carry on with their journey. Some break their backs leaping from the steep banks, but what matters is to keep going. This is the last step of their long journey, and they must reach the opposite bank without drowning or being swept downstream by the river current. The ones who don’t get eaten by crocodiles make their way out -- while some get trampled upon in the process. The spectacle is finally over. Gradually the dust settles, the waters smooth over, and peace returns to the Mara River. Welcome to the height of the high season. Everyone has the same great idea of witnessing the most action-packed month for river crossings. Keep in mind that even in August, witnessing a crossing isn’t guaranteed, and take measures to avoid the crowds. Just like in July, the weather is warm and sunny. No need to worry about rain. The tourist invasion is bigger than ever, so make sure you book well in advance. August is, without a doubt, the best month to see the migration. The herds’ days are action-packed, as this is the peak time for those spectacular river crossings with the crocodiles lying in wait for wildebeest to stumble into their ferocious jaws. The wildebeest are flowing into Masai Mara, so for the next couple of months Kenya will be the favored safari destination. The most important tip for August is to manage expectations. Despite what the astonishing wildlife documentaries will lead you to believe, you still have to be very lucky to see an actual crossing. Animals behave irrationally, especially wildebeest and zebras. Many times they just come up to the river, then wait for hours only to turn around. You have to be fortunate and patient to witness the rush across. Often the drivers are stressed out because they want you to see the big five (lion, leopard, buffalo, elephant and rhino). But your top priority is the migration with its river crossings, make sure to bring a lunch pack and tell your guide to make it an all-day drive. As the river crossings are constantly going on and almost all the animals have reached Masai Mara, we recommend to stay in the northern or western side of the park. Saruni Mara and Entim are popular options. Governor’s Camp delivers on exclusivity if you want to move away from the crowds. Don’t choose a big lodge close to the river. Some of them have more than 200 beds and when these are full, the early-morning game drives inevitably involve long trains of vehicles. Where you will find the fewest vehicles and people are the smallest tented camps that lie along the park’s borders. Stay at a mobile or tented camp. You'll get a more “in the wild” experience, rarely seeing another person or vehicle. Mobile camps are very comfortable, usually consisting of eight to 10 bed tents and a communal dining tent. Each tent comes with an en suite bathroom with a flush toilet. Hire a good guide. The best type of guide will plan the day to avoid the crowds, leaving earlier. He will move off a sighting when other vehicles arrive. He will encourage you to get away from the 'big five’ mentality and just enjoy whatever you come across. Remember the safari rule of thumb: Mother Nature rewards those with respect and patience. September high season in Kenya’s Masai Mara has its obvious rewards. The skies are sunny, crowds are thinning somewhat, dramatic river crossings are still going strong, predators have hit their stride, and the “big five” are all out in view. After August, September is arguably the next-best month to visit Masai Mara. In September, expect sunny, dry days with postcard-perfect sunrises and sunsets. The big crossings still take place, but the summer vacation crowds begin to thin. Due to climate change, some even say this month is better than August, which in recent years has become a little more unpredictable. If the lifecycle of the wildebeest follows its usual patterns, the last herds are now slowly heading eastward through the Masai Mara. They will wander around in search of fresh grass, so be prepared to see big herds of hundreds of thousands animals filling out the vast golden fields of the Kenyan side of the park. As the river crossings continue, there’s also plenty of predator activity. With a bit of luck your chances of seeing lions and cheetahs in action are increased. But keep in mind that only one thing is for certain -- you will encounter a lot of animals. Some guides even guarantee you the “big five”, and the most fortunate will see them all in just one day. The action is still concentrated within the Masai Mara, where lodging options are diverse. Good places to have it all within close reach are Bateleur Camp, Basecamp Masai Mara, Fig Tree Camp, Mara Plains Camp, Mara Bushtops, Mara Porini and Porini Lion Camps. What is the “big five”? The “big five” is a group of five big game species: cape buffalo, elephant, leopard, lion and rhino. The term was coined by the colonial ”great white hunters” in the hunting heyday of the 19th and early 20th centuries. They grouped these five together for their difficulty to hunt and ferocity when cornered. Considered a rite of passage for well-heeled travelers, everybody from American presidents to European royalty and heads of state came to Africa to shoot a large, dangerous animal. The “big five” quickly became known as the most dangerous animals to hunt on foot. The name stuck – although today, shooting is best done through a camera lens. Out of the “big five”, the buffalo is the most aggressive. In the Masai Mara in August and September, you will have a great chance of spotting them all, but some sightings are rarer than others. The shy leopard is perhaps the most elusive, and the rhino is the most endangered. Don’t forget, an African wildlife experience consists of so much more than just ticking off the “big five” list. Many guides will rush to make you see them, which often leads to tourists missing out on many other beautiful encounters. Feel free to tell him in Swahili “pole-pole!” (slow down and relax!). The end of the high season means the crowds have (mostly) left and the “big rains” begin. The migration is straddled between Kenya’s Masai Mara and Tanzania’s Serengeti. Both parks have their own advantages in October. October means the end of the dry season, but there is still a lot activity in the Mara -- even some occasional river crossings. As the rainfall slowly begins to soak into the fields, the savannah goes from golden to green. It’s not until the end of October or beginning of November that the actual rains begin to fall. The days are still very warm with pleasant nights. At this point, the migration is quite scattered. Some wildebeest begin the long trek to the south back into Serengeti, but some remain in the Masai Mara for the whole month. The south region of Masai Mara in particular is still filled with lots of game. By this time, almost all of the big tourist crowds have left, so it’s actually one of the best months for a safari. Lots of animals, fairly easy sightings and you don’t have to compete with throngs of other vehicles and people. The best place to be is in the southern and central regions of the Mara, as most of the wildebeest have left the northern parts. The animals will move slowly in their search for water and green grass. Another good area is the northeast Serengeti and Loliondo Game Reserve, where the animals are returning after their foray into Kenya. The migration is starting to head back into Serengeti of Tanzania, so we recommend staying at the beautifully situated Serengeti Safari Camp, Lobo Wildlife Lodge or Sayari Camp. Masai Mara or the Serengeti? This is the great debate among migration followers. Both Kenya’s Masai Mara and Tanzania’s Serengeti offer an exceptional safari, so your best bet is to string them both together if possible. If you’re set on seeing the great wildebeest migration, particularly from November to end of June, then the Serengeti is your spot. The great migration herds tend to be in the Serengeti during this time, along with the other classic wildlife safari highlights. The Masai Mara, though, is excellent all year round. It’s also less expensive than visiting the Serengeti, so if cost is a bigger priority than seeing the migration, Kenya is well worth a visit. The other factor to bear in mind is exclusivity. The Serengeti is far bigger than the Masai Mara, so it is easier to enjoy a more exclusive safari experience here. That being said, the central regions of the Serengeti can get very busy too, so selecting your camps carefully is key. Opt for a private guide and vehicle. In November the rains starts to fall in the Mara. The plains are back to their emerald green hue, and the migration is on the move southward, back to Tanzania’s Serengeti. Photographers revel in the heightened big cat activity and the stormy skyscapes. The rains from November to March are quite random and usually don’t last for more than a few hours. There’s a chance of heavier rain during this period but not like the long rains in April. If it does rain, it will usually clear in one or two hours, and it’s more than likely that the shower will be localized. As the herds head back across the border, the Serengeti once again becomes the migration hotspot. The wildebeest and zebras are on the move, and most of them can be found in the Lobo and the Seronera Valley areas. In their quest for nutrition-rich grass, they form long columns stretching all the way to the central parts of the Serengeti. Although it’s wet season, the Serengeti can be an amazing place to experience. Photographers love to capture the skyscapes as huge, dramatic thunder clouds roll in over the savannah. You can expect cooler weather, but this isn’t necessarily a bad thing. The animals become more active during this time of the year, especially big cats. As the migration heads south, check out Lake Masek Tented Camp, Ubuntu Camp, Serena’s Mbuzi Mawe Tented Camp and Four Seasons Serengeti Safari Lodge. They are all close to the migration corridor. Although the heavy rains are starting to fall, November is one of the best months if your intention is to see the big cats. As the wet season begins, plenty of predators seek out newborn herbivores, and the action can get very intense. Photography also thrives. Many specialized photographic safari companies offers tours solely for taking pictures of the cats during this period. Watching the big storm clouds roll in can be a very moving experience, especially for photographers. The dark skies, the thunder and lightning all align to create beautiful dramatic backgrounds, and the light is ideal -- particularly if you have a big lion hunting a zebra in the frame. But storm clouds aren’t for everyone. If you do want to avoid the rains in November, your best option is to head down to Selous where the rains usually arrive later than other parks in Tanzania. The dry landscapes usually last until early December. The yearly migration “circle of life” is nearing completion. The rains have returned, and the wildebeest are on the move toward the rich grasses of Ndutu. With pregnant bellies, they’re looking for the best spot to calve in the coming months. December marks the height of the green season in the Serengeti. It’s a wet period, so occasional showers can be expected throughout the whole month. The temperature drops, the evenings turn cooler and it’s a bit harder to spot the animals due to the plentiful water sources. As far as visitors, December becomes a very busy month with the end-of-year holidays coming up, so you may want to avoid the hotspots around the Ngorongoro Crater and other popular locations. In the last month of the year the migration has reached the southernmost plains of the Serengeti, looking for better grass. During this time of the year a lot of other species give birth to their youngsters, so if your aim is to see cute babies, this is the time to go. The wildebeest are in the fifth month of their pregnancy and slowly start making their way back to the nutritious grass of Ndutu where they will soon give birth to their calves in January and February. And so begins the whole year-long cycle of the big migration over again. The migration has come full circle, and camps in Ndutu once more become the focus of the migration (see January - March). Throughout the 20th century, the African safari became a pillar of well-heeled adventure travel, glamorized in film and literature. The elite few paved the way for the more mainstream masses, seeking romance, thrills, and wilderness. But just how long have safaris been a thing? Arabic and African cultures have been exchanging goods and ideas for centuries. Large caravans of traders would travel across vast territories to peddle their wares from one city to the next. The word safari originated from the word safar, which is an Arabic verb that roughly translates as “to make a journey.’” From there, you get the noun safariya, or “journey”. Safari is actually a Swahili synonym of the Arabic word. In the 19th century, the “great white hunters” from Europe started to use the phrase to describe their escapades into sub-Saharan Africa in search of game. Their accounts of spectacular adventures spurred others to follow in their footsteps, and soon the colonial settlers saw money to be made. They started organizing and promoting safaris for affluent outsiders.